Caitlin Kelley appeared on Show 133, recorded in February 2006, at age 18. 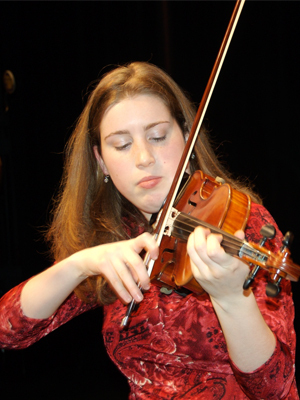 Caitlin Kelley (violin), is a home-schooled high school senior in her hometown of Seattle, WA, where she studies at the Seattle Conservatory of music. The co-concertmaster of the Seattle Youth Symphony, Caitlin is an accomplished Irish fiddler and has been named a Jack Kent Cooke Young Artist. Caitlin is a Jack Kent Cooke Young Artist.